You hear about it, you see it on television - people who employ cowboy builders to work on their house and end up with a botched or uncompleted job that costs far more than they imagined, and which then takes thousands more to correct. But with some care you can avoid the nightmare of the cowboys in your house. It's worth remembering that 100,000 complaints are made every year in the U.K. against rogue builders. One common approach of the cowboy is to knock on your door, say he's "working in the area" and that your roof, drive (or something else) needs work. Without a thorough look he offers a low quote, and perhaps says he has material left over from another job that he can use. His vehicle will look unprofessional, he won't offer a specific schedule for the work. His only phone number will be a mobile, and he'll ask for payment before he begins - in cash, to avoid paying VAT. If it's a big job, such as an extension, you might find that the work goes on and on, with each invoice sucking more from your bank account without much visible progress. By the time he leaves - or you finally give up - your house will probably look like a wreck. Begin with a work specification. It can be anything from brief notes to architect's plans. Make certain your notes include who's responsible for removing all rubbish and making good after the work. Get recommendations from family and friends, or your architect (if you used one). If one quote differs greatly from the others, discover why. There may be a legitimate reason for it, but investigate. Are they members of the Federation of Master Builders? Not being members doesn't make them disreputable, but membership adds a level of security. Are they registered with Trustmark? It's a government plan to help consumers find reliable tradespeople. Ask for several references in your area. Visit them, look at the work done, and ask about the experiences people had with the builder. Discuss payment. For most jobs, builders will require payment at varying stages of the work. Establish how much, when, and what the payments cover. Find out if the builder works on a "labour only" basis, i.e., you supply the materials. This is perfectly legitimate, but means you'll receive two quotes, one for materials, the other for labour. Check their insurance. It should be full public liability insurance, covering not only injuries to workmen, but also householders and guests, passers-by and property. For larger jobs, determine what guarantees the builder offers. If it's a new house, for example, it should be an NHBC warranty. Make sure there's a time scale for the work, including a completion date. But also be aware that outside factors, like weather, could affect that. Don't be afraid to let personal feelings enter into your judgment. If for some reason you simply don't like a particular builder, don't use him. After all, he'll be in your house for quite a while. Before any work begins, draw up a written agreement with the builder, covering all the major points, and include a 'retention,' meaning that the final payment occurs a month after completion, allowing you to discover any defects, and giving the builder the incentive to correct them. You can take the builder to County Court. If the amount is under £5000, it's a small claim, and can be dealt with quickly. Report the builder to Dept of Trading Standards . There has been talk that they, along with the Federation of Master Builders, will publish a "name and shame" list of cowboy tradesmen. If your builder is a real cowboy, he might have already left the area, and finding him to take to court could be extremely difficult. Even if you obtain a County Court judgment, you can only get your money back if the builder has it. It's worth remembering, too, that it takes no special qualifications or certificates to be a builder. Legally, anyone can call himself a builder and charge for his work. Your home is, quite rightly, your castle. The simplest way to avoid problems with it is to take time in the beginning and find the right contractor. A low quote might seem attractive, but you could be buying yourself trouble. Do your research on the builder. Never pay anything in advance. Don't do business with anyone who's "just in the area." Trying to Find a Reputable Tradesman? If you're looking for more advice on how to find a reputable trades person, why not take a look at Finding a Reputable Tradesman on the www.saferhouses.co.uk website. Northumberland Trading Standards and Northumbria Police failed to take any action against a builder who was preying on elderly and vulnerable people. Indeed Northumberland County Council went out of there way to discredit anyone who complained and to protect a builder who had 24 complaints against him and who had taken deposits without doing work and who had his companies work condemned by building inspectors numerous times. Northumbria Police were equally disgusting and I would think twice before investing in this corrupt area with it's disgusting police force and County Council, with particualar reference to the former Chief Executive and the Trading Standards Department, which is as economical with the truth as the builder in question. George Michael, Jorghe Mihai, Romanian builder based in slough, London. Might claim to be Spanish. An evil person, with his friend Alexander, have no problem being aggressive and lies and cheats like second nature. Avoid! Re: Northumberland Trading Standards Northumberland Trading Standards are in my honest opinion the worst organisation I have ever come across, they actually claim that it's not in the public interest to prosecute Rogue Builders who commit serious fraud in relation to elderly and vulnerable people, despite there being numerous cases (in to double figures and most with Building Inspectors Reports or CCJ's) and allegedly as many as 24 complaints. According to FOI requests Northumberland Trading Standards had one prosecution in five years for £100 at the Magistrates, and may as well not exist. They will try and hide behind the morally bankrupt LGO, and the limited powers of other organisations, but their own incompetence and ineptitude is plain to see, as is that of their management. They even accuse the very people who are the victims of crime of wrong doing and collect pointless data which they will keep about you for at least six years including medical data and personal sensitive data and hide behind the fact they can collect data under their remit, so be extremely careful what you tell them as it will inevitable end up on their records, indeed a lot of the records they kept on us were not even correct and was also very trivial and were used to discredit us, and we were the victims of fraud. Northumberland Trading Standards constantly harp on about their limited powers despite taking cases directed to the police by a concerned MP back in to their fold, in order to take no action. Our only regret is letting Northumberland Trading Standards on to our property in the first place. I have gone to small claims court about abbey roofing damp proof contracters this man does not own his house been to land registry don't know his bank account details so sent bailiffs in he wants stopping he will keep on doing it. Also not down that he lives there went to county hall he should get fined for not filling form in. Also reported him to tax manas above man who is four thousand out of pocket report him and take him to court. As per the comments above from 'kamathy'-do not use Abbey Roofing & Damp Proofing of Spawd Bone Lane, Knottingley. The owner John Varey is a con man! We had a leaking roof and had the entire roof replaced as he stated it was looking worse for wear. Nearly £4000 later and the roof is still leaking! 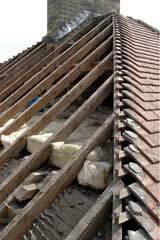 He has skimped on materials and the work is substandard to say the least-and that statement comes from our House Insurance company who sent an expert builder round to assess our roof. We have attempted to contact him on many occasions but he refuses to answer our calls or respond to the many voicemails we have left for him. Be warned, he comes across as friendly and helpful but will rip you off as soon as look at you. We are taking legal steps to recoup the money we paid to him, and i'm hoping we can stop him doing this to any one else by stating our experience here. Abbey roofing and damp proof contracters of spawd bone lane knottingley west yorkshire. Dont have this man at any costs he started to build small extension paid money up front no foundations just done breeze blocks no knowledge of building work whatsoever. Left me with a mess to have to pull down and pay someone decent who has started to build it right and hasnt even asked for no money. He is liar said he had informed building inspector hasnt clue how to build left me with no drain He walked away with 3,000 pounds i know where he lives asked for my money back he said no. Was going to take it to small claims court but has he any money as if not will end up with nothing and more expense. Avoid him at all costs john varey of abbey roofing and damp proof contracter 33 spawd bone lane knottingley west yorkshire. My builder (if you want to call him that, took a whopping £26000 from me to build aconservatory (that ended up as a botched extension with very very bad building work) and a garage. I have been told that both will now have to come down and be rebuilt. I took out a loan to cater for this as I wanted to used my savings to redecorate the remainder of the house. It took this man 7 months to rob me and leave my house in a dangerous state. Once he had all of the money he asked for more, stating that he quoted me wrongly and he needed £11,000 more to complete the job. Nothing was complete. he would start one thing, leave it half done and then start another. That way he expected me to give him more money to complete. I am so angry but I cannot take him to court, because I know that he hasn'tany money. I would be spending more of my own money trying to get money back from someone who does not have it. I will not be satisfied until he held accountable for what he has done. I am a Christian but as yet I do not have the Christ like qualities as I cannot forget or forgive what this man has done. He has made my life a loving hell. My house is in turmoil because of this. Everyone that I have had around to look at the property to see if it can be salvaged have stated that it is so bad and I should take care, because it will eventually fall down; my only option would be to tear them down and start again. OLIVER BLACKMAN is his name living in London, Harlesden. He is a liar and a thief. Keep away from him. The horrible thing is that he was recommended by a member of my family, who afterward stated that he would not let him touch anything in his own house, but yet he recommended him to me and as rumour has it, is still on friendly terms with this man after what he has done to me. OLIVER BLACKMAN aka LAWRENCE BLACKMAN - keep well away from the nasty beast. 103A High Street Harlesden, London. He will steal your hard earned money. Mark Fittes companies have a nasty habit of going belly up after a year or two and he constantly tries to get more money up front out of customers. Whilst Neil Farrer and Mark Fittes both have a history and were both Directors at BSG Contractors Limited (Sunderland) and North East Building Solutions (Low Fell) with Farrer having further building companies in relation to Angel Home Developments Limited (Sunderland) which a month after being dissolved became Angel Home Improvements Limited (Sunderland) before also being dissolved. When anyone comes asking to do your drive, ask to see their boots. A genuine tarmac worker will have a pair of books caked in the stuff! Also ask what they are putting down, if the answer if "tarmac" close the door and call the police.